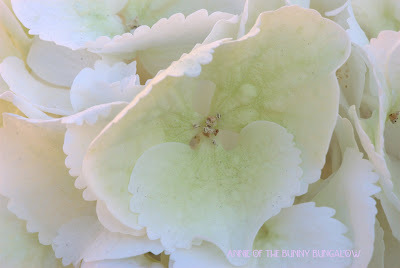 These are last year's Hydrangeas but the ones below will soon be this beautiful. The leaping bunny is watching over the new blooms of the potted Hydrangea macrophylla, Blushing Bride, which is my favorite from the Endless Summer Collection. Blushing Bride starts out a wonderful pale green, as seen above, then becomes a pure white mophead, then the palest, blushing pink. They are enchanting and the only hydrangeas that I've been able to bring into bloom in the cursed Houston heat and humidity. Other hydrangeas in the Endless Summer Collection are The Original, which Tall Husband and I found and re-potted this past weekend, and Twist-n-Shout. Come on Baby, bloom for Mommy...O.K., bloom for Daddy. Hydrangeas are my favorite. I have probably a dozen bushes now, various varieties and colors. I love the way the blossoms change their color as the summer turns to fall. Your hydrangeas photograph is amazing! Really amazing!